1. Have client take the stress test to establish their Stress Number. 2. Establish a stress reduction plan based on the recommendations of the test results. 3. Have patient implement the 10-20 minute sessions. Average visit fee is $40-50. This evidence based stress test calculates past and current effects of stressors on your body and generates what we call your Stress Number. That number can be used to determine the number of stress reduction sessions necessary. Why Offer Stress Reduction Services? Setup on left shown with optional large screen monitor and reclining chair. Over 80 years ago, medical doctor and researcher Hans Selye began his groundbreaking work in the study of stress. He went on to become one of the most published and honored researchers of all time. Many other researchers over the last 50 years have added to his original studies. All of their work can be distilled down to two words: Stress Kills. Mechanical stress, chemical stress, emotional stress, the body reacts to all in the same manner. First the body releases adrenaline, cortscol and norepinephrine. This is know as the body's "Fight or Flight" response. Under normal circumstances the body works through the short-term stressor and undergoes a recovery period. However, repeated stress from prolonged single or multiple events can cause the body to forgo the recovery period and try to adapt to the stress as if it was a normal part of life. This situation eventually leads the body to exhaustion and advanced aging. What's the most stressful job in the United States? Ever notice how much older a President looks when leaving office? 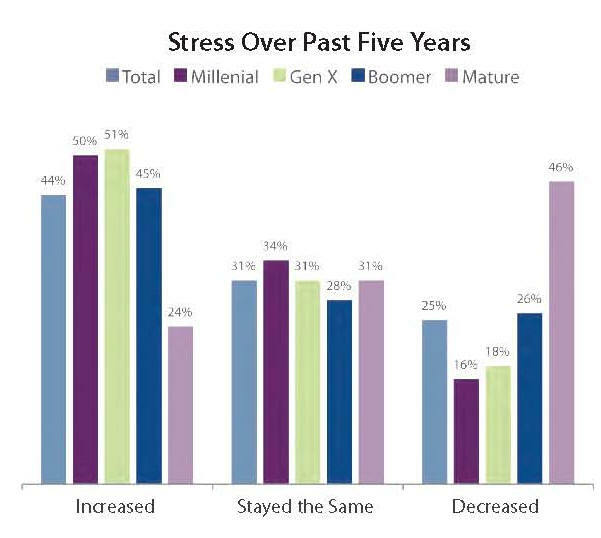 It's not just the years, it's the stress. Seyle's research, later validated by others, predicted the types of diseases that would be the result of stress without proper recovery. These ailments range from chronic infections to heart disease. It's no secret that today's life is more complicated and stressful than in past decades. It's harder to find the time for ourselves, time to recover from the everyday stress from family and work. This is why we created the Relaxati[n Stati[n®. A 10 minute session can transport you to a different place. Visit a secluded beach, watch magnificent waterfalls, travel through space, etc. 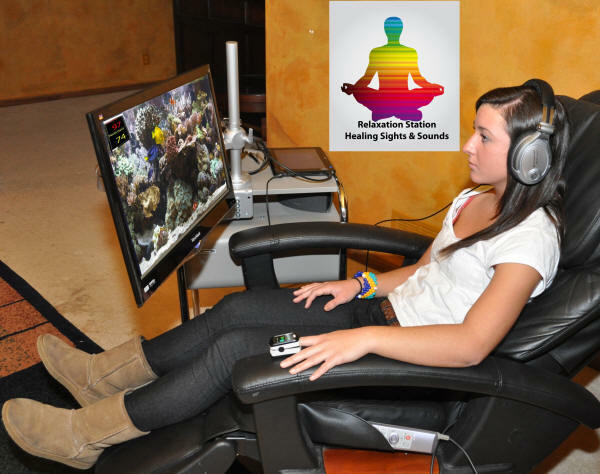 The relaxing video images are enhanced by special binaural sound designed to melt away stress. You can also add our 10 minute healing session. Using special color and sound combinations, specific maladies can be targeted for relief. The Relaxati[n Stati[n® service can be marketed as a quick one time session, or as a series of sessions for specific issues, based on their Stress Number. For over 2,000 years color has been used to create specific human physiological responses. For the past 50 years sound has been used for similar purposes. Depression,Fear,Nervous Problems,Immunity,Joint Inflammation,Endocrine System,General Pain,Hyperactivity,Anxiety,Tension,Energize,Revitalize,Be Happy,Tranquility,Patience,Psychosis. AND Two Special Screens for WEIGHT LOSS and STOP SMOKING. NEW: Violet screen added to help reduce incidence and severity of stress acne. But the Relaxation Station does not stop there. We have also added 8 movie clips with special binaural sound and photic stimulation for the ultimate relaxation session. Here's what the main screen of The Relaxation Station version 2.0 looks like. The Windows 8 Tablet can be a stand-alone delivery system or it can be the control head to send the signal to a large monitor of TV via HDMI connector. You don't really notice it except if the room is dark, but the colors from your monitor are actually bathing the viewing area in colored light. It's an active and not a passive system, pushing light through the screen as opposed to looking at colored paper that is simply reflecting light. Your computer monitor is capable of displaying all the primary colors and blending and displaying over 16 million other colors. 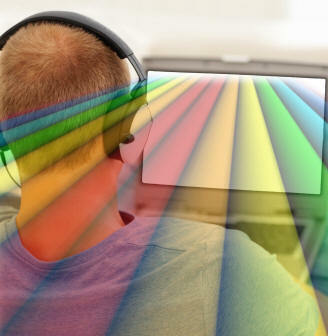 These features can turn your monitor into the perfect colored light generating system. It starts with the screen images. First you will notice we don't use images of a solid color. Staring at a solid color can cause rapid eye fatigue and cause the client to lose interest. We use two colors in a specific geometric patters (more on this later). Our colors are based on the RGB (Red,Green,Blue) color system. This is represented in the picture below. The RGB system is used to create the colors coming from your computer monitor. Each color is assigned a specific value of how much red, green and blue are in the color. 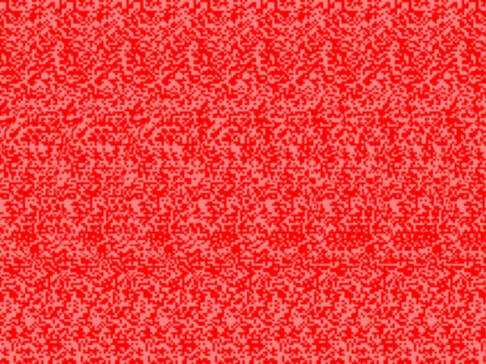 For example Red has an RGB value of 255,0,0. Green has a value of 0,255,0 and Blue has a value of 0,0,255. Relaxation Station is NOT about shining a light on part or the whole body. It IS about using the eyes and ears as direct pathways to introduce the healing effects of the Relaxation Station to the brain. In our Dark Blue Screen (Sample at the left), while we use what appears to be two colors of blue they are actually two shades of only blue. (RGB of 0,0,255 and 0,0,187). So we are able to create an image that is pleasing and engaging to the eye while maintaining the integrity of the selected color. This is a Relaxation Station exclusive. Is Colored Light Really Being Emitted? The unretouched picture to the left was taken in a darkened room with the subject three feet from the screen. Compare the color being shone on the subject with the Relaxation Station image that was on the screen (above). The Relaxation Station uses precise RGB calibration to ensure the proper colors are being used. Much work has been published regarding the use of sound patterns to induce various brainwave states like Alpha and Theta to achieve a deep relaxation. Again, we take this to the next level by using special binaural audio clips. "Binaural" refers to recording from two sources and combining the recordings so the left and right ear perceive a unified sound but in reality they are hearing two different things. For the purpose of inducing an Alpha brain wave pattern we vary the recording of one channel by 10Hz. This frequency differential creates a "beat" frequency that helps induce the desired brainwave. Another Relaxation Station exclusive. These special sound files are used in both the color therapy and video sessions. We told you we would come back to why we use two colors in each screen image. It's so we could create stereoscopic images for all the color screens. 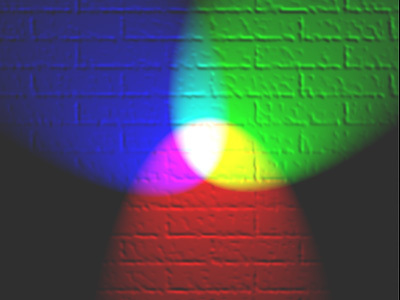 In this image we use red with two different RGB values but still only in the red spectrum. Can you see the 3D Yin-Yang symbol floating in the middle of the image. Look at something in the distance, hold that focus and look again at the screen. Decoupling the eye focus allows the 3D effect to appear and you are suddenly "in" the picture. When this happens a profound calmness comes over the viewer making it very relaxing to view the image. The use of these stereoscopic images is another Relaxation Station exclusive. 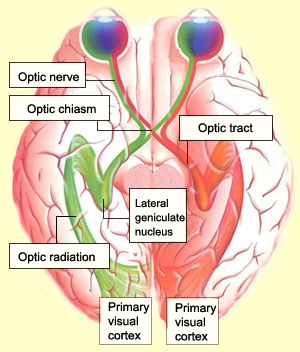 Many studies have shown that introducing a flashing light into a person's field of vision over time can cause the brainwaves to match the frequency. The Photic Stimulation source of the Relaxation Station pulses at 10 pulsed per second to help the person achieve an Alpha brainwave state. Anderson, DJ, Legg, NJ, Ridout, DA. Preliminary trial of photic stimulation for pre-menstrual syndrome. J. of Obstetrics and Gynaecology, 17(1): 76-79, 1997. Russell, HL, and Carter, JL, A Pilot Investigation of Auditory and Visual Entrainment of Brainwave Activity in Learning-Disabled Boys. Texas Researcher, J. of the Texas Center for Educational Research, 4: 65-73, 1993. Shealy, CN, et al., Effects of Color Photostimulation Upon Neurochemicals and Neurohormones. J. Neurol Orthop Med Surg, 17: 95-97, 1996. Want to Experience The Relaxation Station? 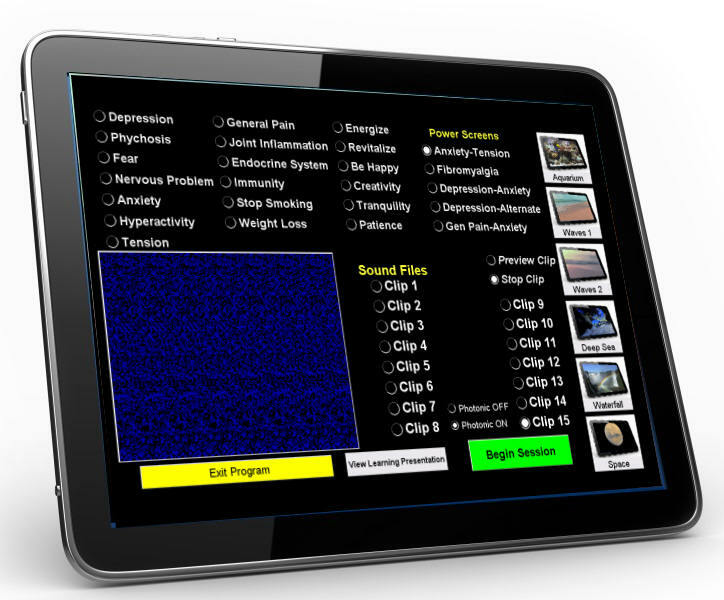 By clicking on the blue rectangle you will be taken to a screen with a larger screen image and the actual background sound, minus the Photic Stimulation option. For best binaural results, use stereo headphones. 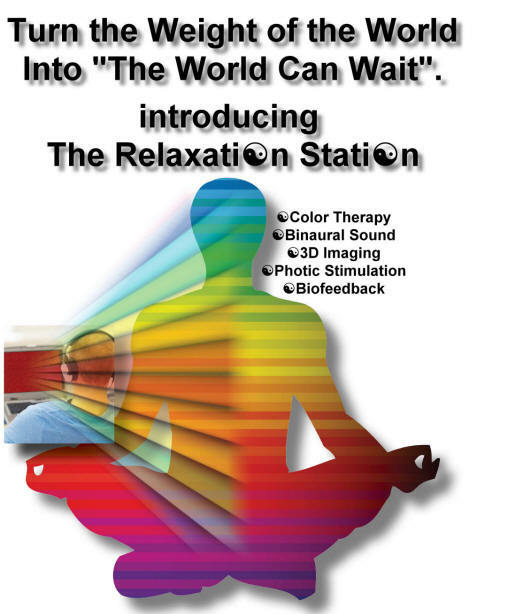 The Relaxation Station comes with eight video clips, embedded with binaural sound and photic stimulation. These videos transport you to some of the most peaceful locations on Earth, under the sea and even in space. Click Here to view samples of the videos. Take a 10 minute vacation and feel a deep relaxation that only comes from the Relaxation Station experience. Shown on the left is a typical setup showing the computer on the table, next to stereo headphones, comfortable chair and external monitor. Optional marketing posters are shown on the wall. Because the screen of a tablet PC is adequate to deliver the content, you may find that all you need is a comfortable chair for your clients to sit in and a good pair of stereo headphones. 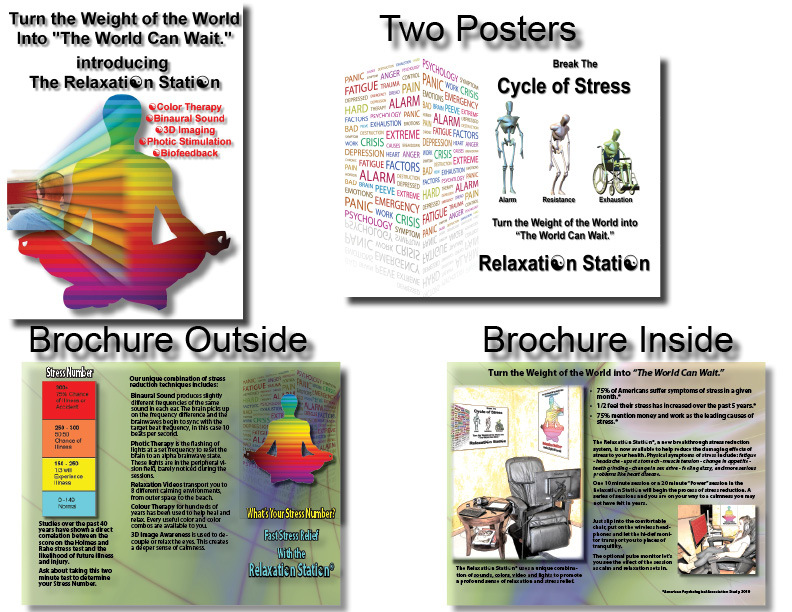 As part of your purchase you are allowed to advertise that you have a Relaxation Station® in your office, mall kiosk or at a seasonal event, like a home show. 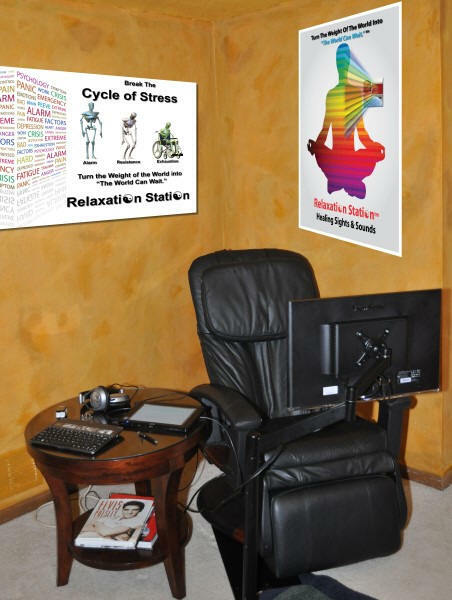 Note Relaxation Station is a registered trademark of Dr. Joe Ventura for stress reduction services. Optional Marketing Tools : We can provide two different marketing posters and a pdf file of our marketing brochure. Cost is $300. Add the Optional Marketing Retractable Banner for $199! This optional banner extends to over 7ft tall and provides a lot of visual recognition for your Relaxation Station services. So to sum up, for under $500 you can add stress reduction services to your existing business, or start a new business based on the Relaxation Station and potentially add thousands of dollars in income. Ready to add the Relaxati[n Stati[n today? The Relaxation Station designed by Dr. Joe Ventura is reasonably priced.